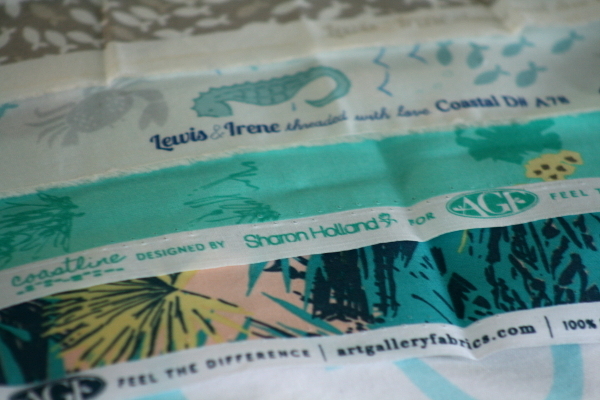 Surely yesterday’s post makes it no surprise that I have a weakness for coastal and beachy themed fabric. 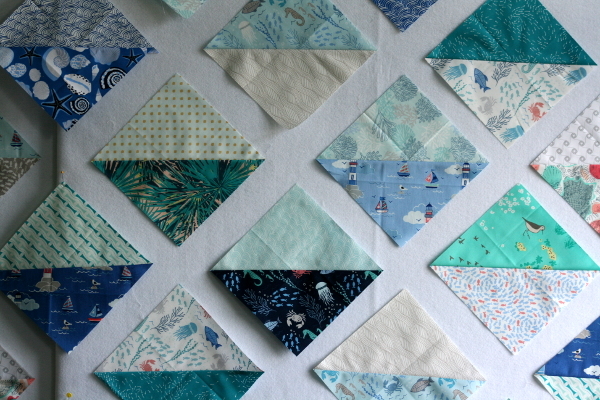 My Anchor quilt, as well as the Anchor’s Aweigh quilt are coastal in design and color scheme, and my Seaside quilt is another older favorite. As I prepared for our annual week at the beach, I had the sudden urge to cut into all my coastal fabric. This project comes mostly from two designers: Lewis & Irene, who designed the Coastal bundle I had, and Sharon Holland, whose Coastline fabric I also had a nearly complete bundle of. There are a few other designers whose work is in the mix, but the bulk comes from those two collections. A quick sketch for a design and the cutting began. I had high hopes for a completed quilt top to take with me for photos, but instead I managed a bunch of large half square triangles (HST) and hundreds of smaller ones that still need trimming. My design wall is currently in my bedroom instead of my sewing room because we’ve got guests coming and going every week or two for much of the summer and I’ve taken over a small table for my sewing machine. These happy colors greet me every time I walk in the room and I’m hopeful I’ll find a few minutes to sew again soon.